Making mistakes is a normal part of the learning process. We are born with two strategies for learning, one is “trial and error” another one is imitating. Without errors and mistakes, there is no progress, no development, no learning. 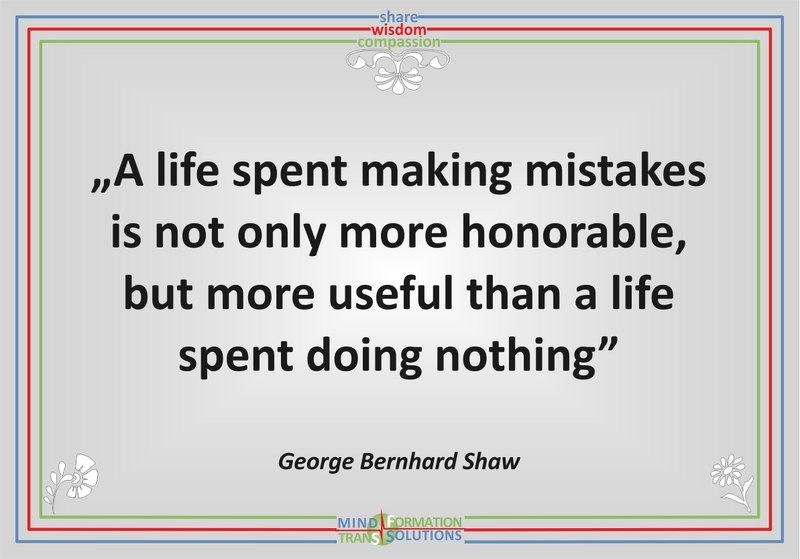 There is only one type of people who do not make mistakes – people who do nothing. “All our days are numbered. We cannot afford to be idle. To act on a bad idea is better than not to act at all, because the worth of the idea never becomes apparent until you do it. Sometimes this idea can be the smallest thing in the world, a little flame that you hunch over and cup with your hand and pray will not be extinguished by the storm that hauls about it. If you can hold on to that flame, great things can be constructed around it, that are massive and powerful and world-changing… All held up by the tiniest of ideas”. Do something. Enjoy your learning process, be happy with your successes and learn from mistakes. Use well your time.